The 2019 recipients of our Arts Grants have all demonstrated a fantastic calibre of creativity, inspiration and passion in their unique and stunning project proposals. Making the selection for these recipients was no easy feat for our team given the high quality of talent demonstrated by these established and emerging artists, but we trust you will find all their creations truly impressive. 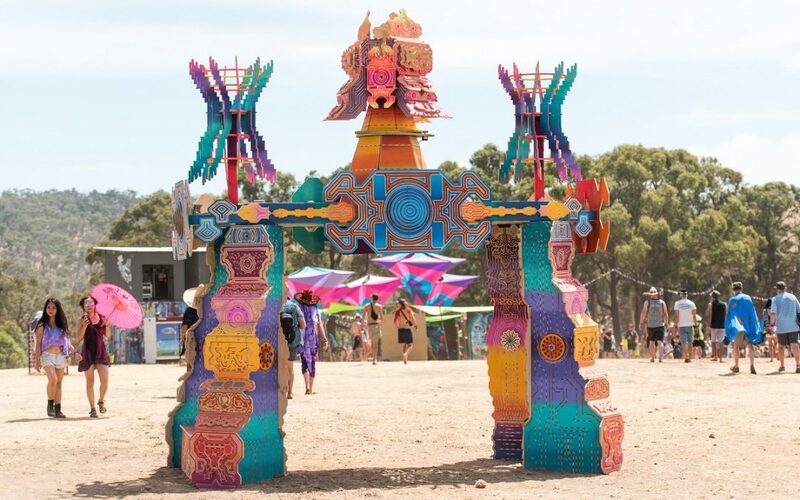 We are so excited to see them being showcased at Rainbow Serpent Festival in 2019 and can’t wait for you to be enchanted by them too! We welcome your applications for our artist grants in 2020 if you feel inspired to showcase your creations as well. Stay tuned for some sneak peek previews coming soon from our artists as they bring their projects to life. Our wonderful team has shown great dedication in carefully considering each entry and we know you will be very impressed with these creations – we can’t wait to see them coming to life. Big love and congratulations to these recipients and their amazing projects. The Hyper-Shelter is a raised hexagonal seating platform providing shade by day and pulsating with light by night. The Whale Shark is known as the Gypsy of the Deep, a tactile sculpture that comes to life as a lightshow at night. Stellarium is an exploration of the interplay between reflected light, colour and polyhedral geometry. Love Booth is a reflection on what’s in your chest and the beat of humanity. An art installation created out of disposable waste and products that are not recyclable. A pop-up theatre transforming into a theatrical wonderland that re-imagines waste as a platform for experience. A commentary on the current state of the landscape in central Victoria and the alternate possibility of a thriving wetter ecosystem. The Spirit Trees installation gives trees a voice to their spirit, showing us how to harmonise with them and one another. A fun and interactive sculpture inviting you to take on different personas with a collection of ridiculous cartoon hats and eclectic props. A project bringing a 3D face to life with live projection-mapping synchronised to music.